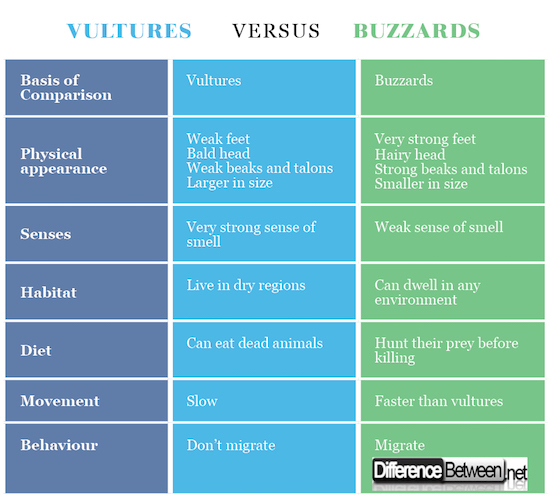 Understanding the key differences between vultures and buzzard is essential. The two birds have been quite confusing to many people for a long time, but some fundamental aspects differentiate the two birds. A vulture is a scavenging prey, and there are two types of vultures. There are new world vultures, and they include Andean condors. There are also old world vultures, and these are the ones that are seen scavenging on the carcasses of animals that have died. A buzzard, on the other hand, is a unique bird of prey. It is mostly found in Europe, but it extends to some parts of Asia. To understand the birds more, this article shows their unique traits and the differences between them. As seen above, vultures are scavenging birds of prey. Interestingly, they are found in all continents except Australia and Antarctica. One popular trait of these birds is that they have a bald head devoid of usual feathers. For a long time, this feature has been attributed to helping the birds to keep their heads clean when they are feeding. In addition to this, the bare skin aids in thermoregulation. There are new world vultures, and these are found in warm temperature areas. There are also old world vultures, but the two are not closely related. It is rare for vultures to attack healthy animals. They mostly attack sick or dead animals. Below are some characteristics of these scavengers. 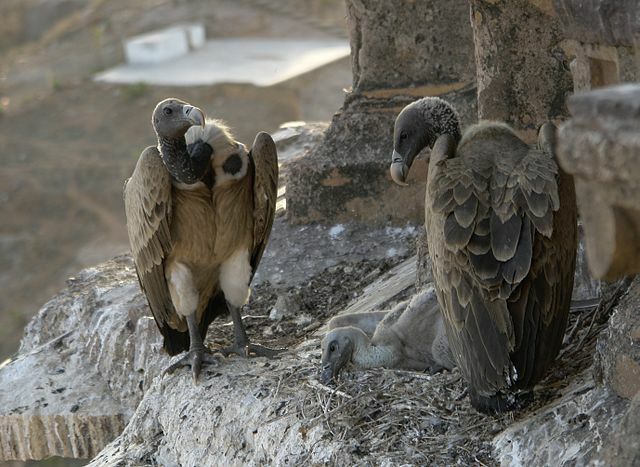 Most vultures prefer the bones of their carcasses rather than flesh. 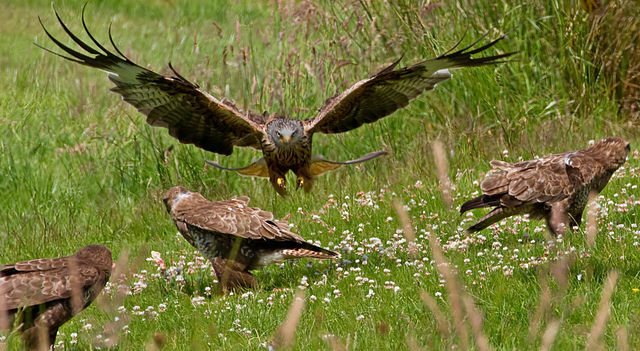 These are birds of prey that live in a wide range of habitats. They can survive almost anywhere. They can live in grasslands, forests, and even deserts. These birds mostly feed on the remains of dead animals or small mammals. Just like the vultures, they can fly high, and their wings have been found to help them to adjust to air currents that keep on changing. They do not form flocks. However, they can be seen together during migration. They mostly feed on rabbits, but they can also feed on small mammals and carcasses. Females tend to weigh more than the males, and that is why the males are considered as ideal hunters. Vultures have weak feet, and this is okay for them because they do not use them to grasp their prey. Buzzards, on the other hand, have strong feet because they use them to grasp their prey. Buzzards do not have bald heads, but vultures are prominent for their bald heads. Buzzards have strong beaks and talons to enable them to kill their prey and feast on them. Vultures on the other hand rarely kill their prey. Therefore, their beaks are fairly weak. Vultures tend to have a very keen sense of smell. They can smell a carcass from miles away. As for buzzards, they have a weak sense of smell. Buzzards can live in almost all environments. They can live in mountains, lowlands, and deserts among other places. Vultures on the other hand barely live in cold regions. They thrive in Africa, the drier parts of Asia and the warm areas in Europe. The main diet of vultures consists of dead animals. The only type of vulture that prefers a different diet is the Gyphohierax angolensis, and it feeds on oil palm fruits. Buzzards eat rabbits and small mammals mostly. However, they can still feed on dead animals. The behaviors of the two birds differ in that while buzzards are predators, vultures are scavengers. Buzzards tend to migrate. Vultures do not migrate. Vultures have good eating habits. They will be cautious while eating. As for buzzards, they will dig into their meals and dirty themselves while eating. Due to their large sizes, vultures cannot move as fast as buzzards. Buzzard are smaller in size. Therefore, they move quite fast in the air because they are lighter. Both vultures and buzzards are birds of prey, and sometimes, they can be mistaken for one another. Their physical features do not differ so much unless one is keen on them. However, over the years, a lot of research has been done on them, and it has become easier to distinguish the two birds. Vultures are popular for their bald heads and long necks. Buzzards, on the other hand, do not have such necks and a bald head. Both birds have distinct features to help them to survive. For instance, vultures rarely kill their prey. Therefore, they have weak feet and beaks because they do not need the features as they will not kill their prey. Buzzards, on the other hand, are killers. They have strong beaks to tear into their prey. A buzzard’s feet also have a considerable amount of strength because they need them to grasp their prey. Therefore, from this piece, we can come to the conclusion that both birds are similar in some ways, but they also have their differences mostly for survival and habitation. Evah Kungu. "Difference Between Vultures and Buzzards." DifferenceBetween.net. May 15, 2018 < http://www.differencebetween.net/science/nature/difference-between-vultures-and-buzzards/ >. Legg, G. (2004). Birds of Prey. Salariya Publishers. Fodor’s. (2013). Fodor’s The Complete Guide to African Safaris: with South Africa, Kenya, Tanzania, Botswana, Namibia, and the Seychelles. Fodor’s Travel. Clark, W. S. (1999). A Field Guide to the Raptors of Europe, the Middle East, and North Africa. Oxford University Press.